Mullet Creek contained a couple of surprise waterfalls and an old dam in the short section we hiked. It originates in Meadowvale north of the 407 and empties into the Credit River on the University of Toronto Mississauga campus. It was a gorgeous long weekend and Thanksgiving Monday was a beautiful day for a brief hike before getting the turkey in the oven. 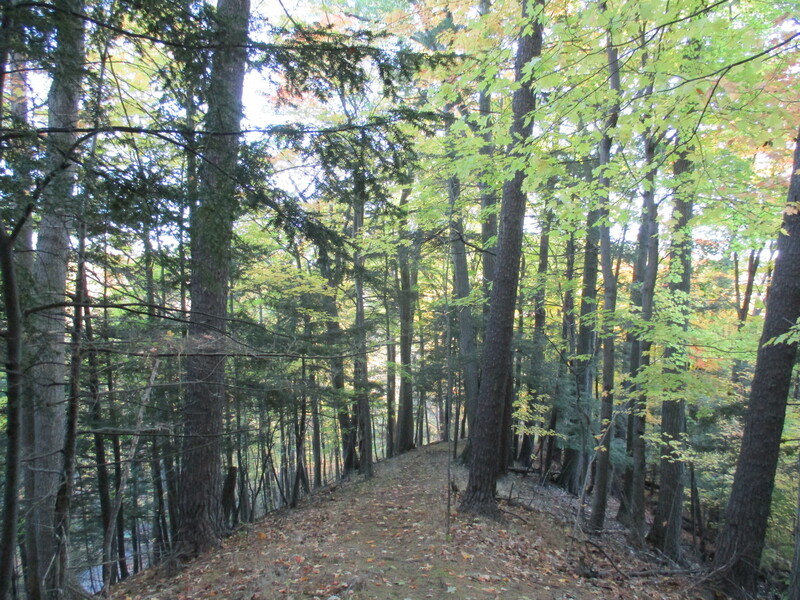 We parked on O’Neil Court and entered the woods through the community walkway. Reginald Watkins bought 150 acres of land in 1928 north of the now abandoned Erindale Power Dam. He tore down one house on the property and enlarged the other which was named Lislehurst. In 1965 The University of Toronto bought the property and founded Erindale College which is now called University of Toronto Mississauga. 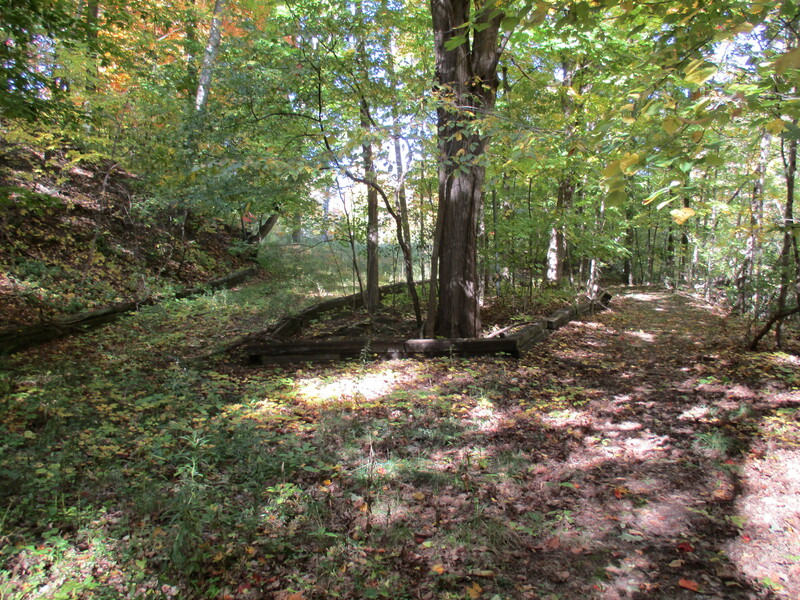 The section of park backs onto the university campus and contains the remains of an old out building at the crest of the hill overlooking the ravine. It appears that a series of trial excavation holes have been dug to investigate the ruins. A long thin promontory of land provides access to the creek level. We followed it down to where Mullet Creek winds it’s way through the ravine and on to the Credit River nearby. The creek splits into sections in the ravine and we crossed each in turn as we made our way north along the valley floor. There are over 30 varieties of periwinkle. As an invasive species they grow aggressively, often choking out native plant life. They are frequently recommended for partially shaded areas or places where growing plants is difficult. Care must be taken because they can escape and take hold in the wild. One plant can spread to an area 8 feet across. 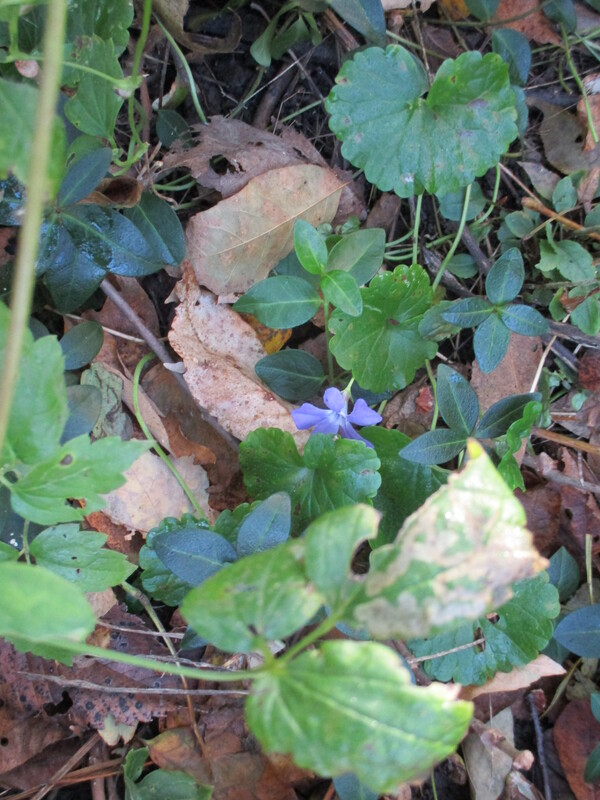 They normally bloom in late April to early May but we found a stray splash of periwinkle blue in the undergrowth. 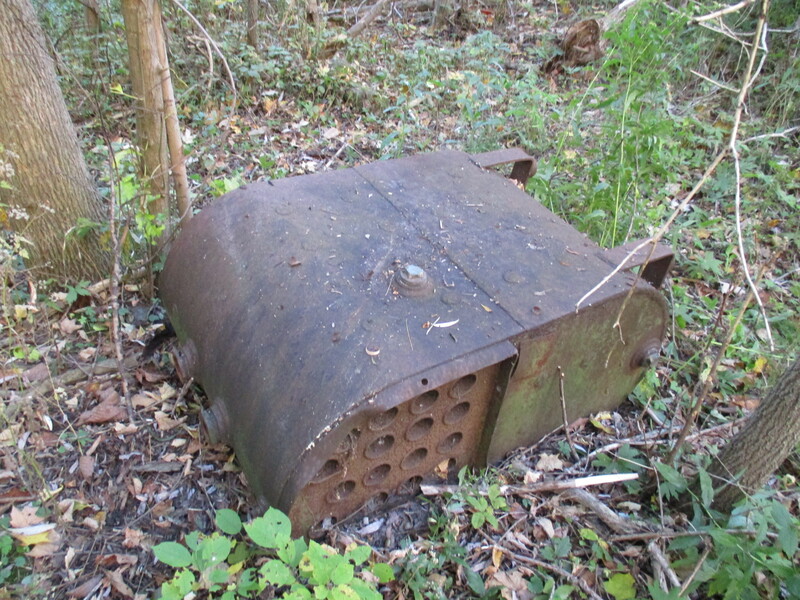 An old steam boiler lies rusting away at the side of Mullet Creek. It would have originally stood on four metal feet on the bottom. The lower half contained the fire box and was open on the opposite side to this picture. The front flue sheet contains the holes that the flues passed through and is matched by a second flue sheet on the back. Mullet Creek is crossed by the double span of Burnhamthorpe Road. 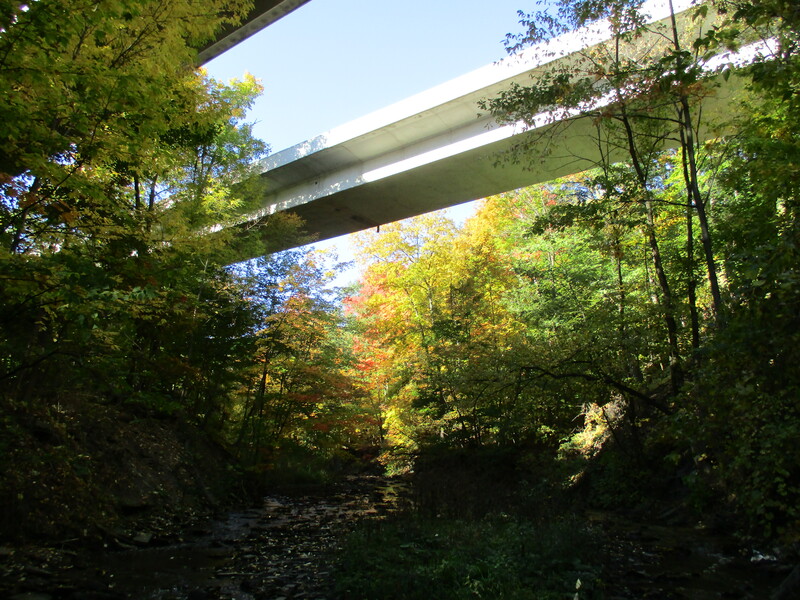 A recent assessment was done for this bridge as well as sister bridges over the Credit River just east of here. Original construction had created bridges where the sidewalks were too small to be properly functional. The study was completed to address several concerns. At just .838 metres high, the guard rail on the river edge of the sidewalk was considered too low for safety. The proposal was to increase this rail to 1.4 m. There was also no rail between the sidewalk and road and so a second rail was proposed on the curb side. The sidewalk was to be increased from 1.7 to 3 metres wide to allow cyclists and pedestrians to safely pass. Look-out platforms were also created. This was accomplished by widening the road deck on the outside of the bridge. The west bound span is seen from the creek level in the picture below. Just beyond the Burnhamthorpe bridge lie the remains of an old dam. 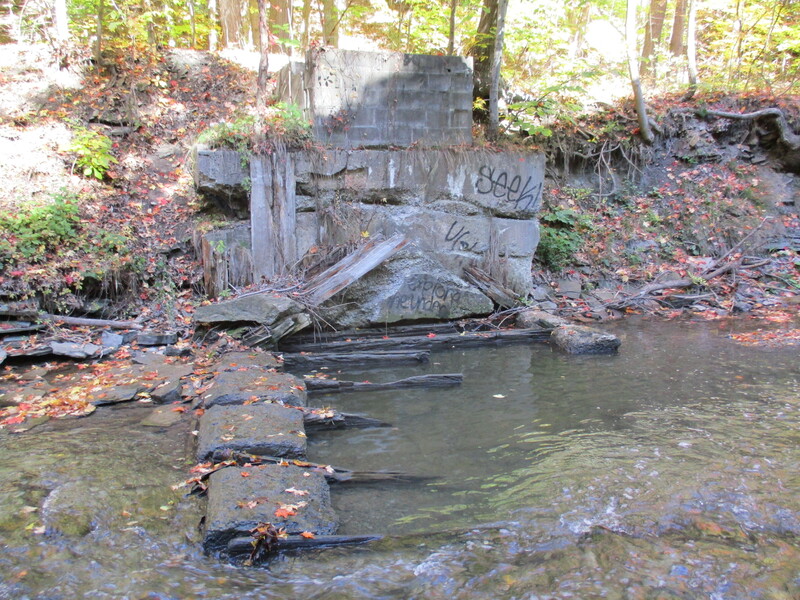 Original wooden sections remain submerged in the water behind later concrete forms while the pre-cast concrete blocks on the top were added later still. 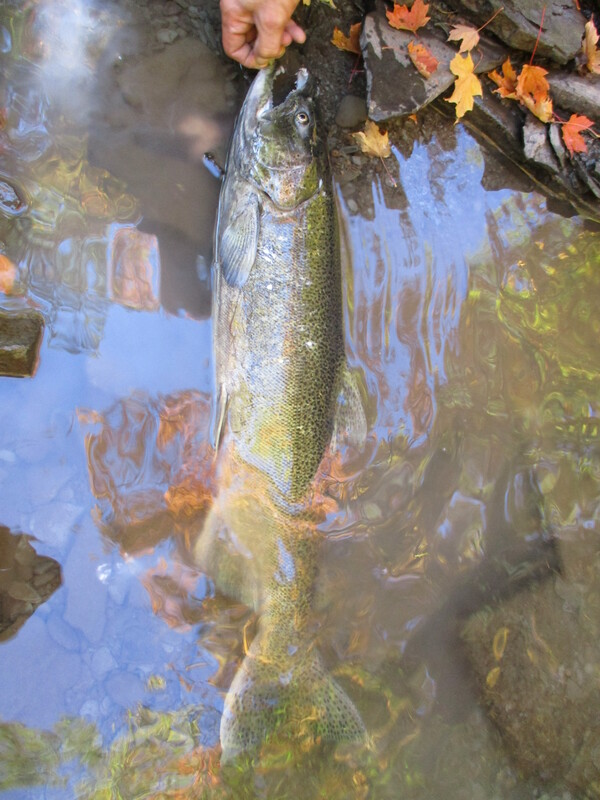 Prior to the arrival of Europeans, Atlantic Salmon were common in Lake Ontario and spawned in the Credit River every fall. Due to pollution, dams, over-fishing and deforestation they were basically eliminated by the 1890’s. In the 1960’s and 1970’s Chinook and Coho Salmon were introduced from the Pacific coast. Chinook Solmon make their only spawning run when they are 4 years old and then die afterward. This male Chinook has developed the characteristic hooked jaw called a kype and the darker colour of his one and only run upstream. They can usually grow to lengths of 3 feet and weights of 25 pounds. This specimen was caught by a young fellow named Jack who was fishing with his family. As you walk up Mullet Creek toward Mississauga Road you come to several shelves of shale where the water cascades over the edge. The picture below was taken just one bend in the creek prior to the cover photo which has a larger drop. These two little water falls make an oasis in the heart of the city. At one time a parkette stood at the corner of the creek and Mississauga Road. The remains of the old parking area are starting to grow over but the old rail ties that outline the side and protect the trees in the middle will be around for many years to come. Mullet Creek extends from here to north of the 407 and must contain other interesting places. Time will tell. 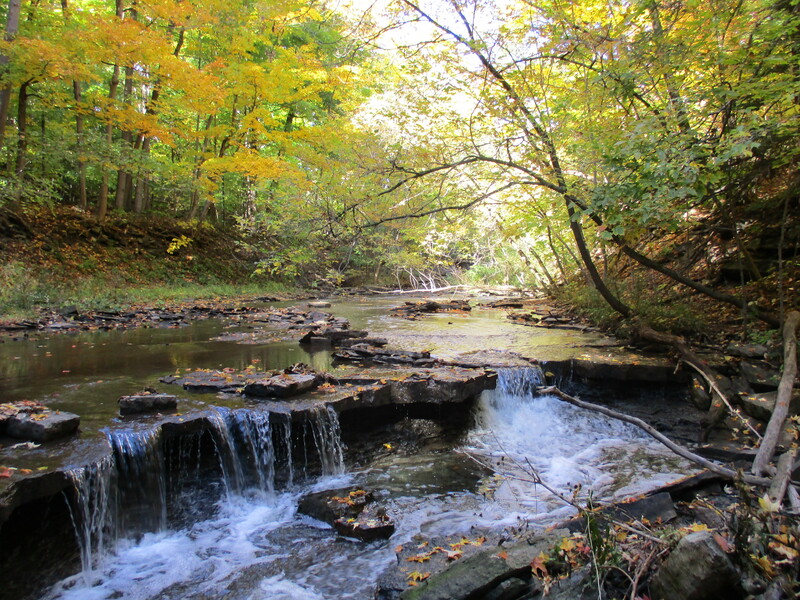 This entry was posted in Credit River and tagged Burnhamthorpe Road, Chinook Salmon, Mullet Creek, periwinkle, waterfalls on October 18, 2015 by hikingthegta. I’ve never known about this creek. Also that looks like a nice looking salmon. We’ve been getting good runs up the Don here in the East end hoping that we get more years like this ahead and the river keeps improving. What bus would one take to get to this beauty? 26 Burnhamthorpe. Get off at Mississauga Road. It’s in the north east corner. That first waterfall was on our property where I grew up in the early 60s. It was our swimming hole. 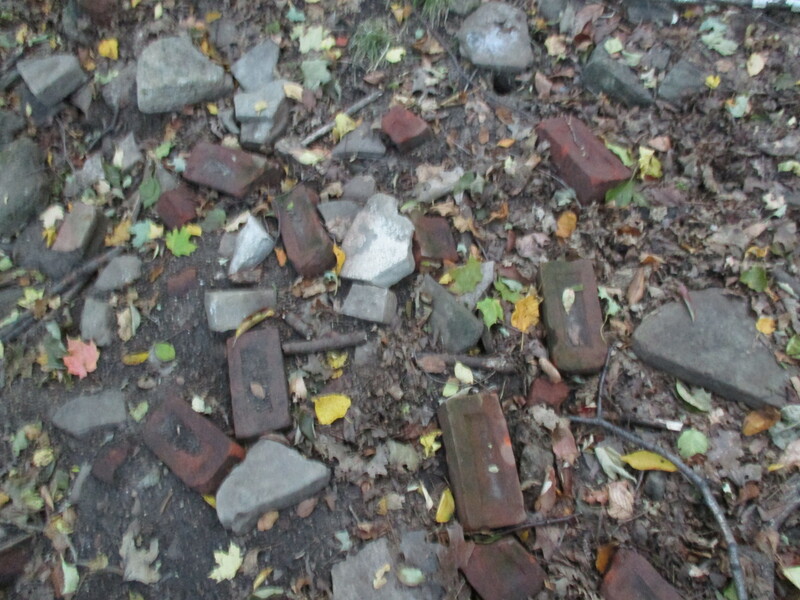 All the kids cleaned out broken sandstone and shale pieces every spring after runoff so we could jump from overhead. The dam you see was a weir we would slide down on our way to walk to the Credit River.